The open edition art print market is evolving and giving visual artists new ways to leverage new art career opportunities. 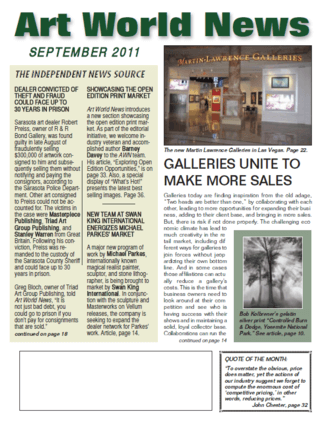 The article here is reprinted with permission from the September issue of Art World News. The publication is must reading for visual artists, fine art photographers, art publishers and galleries. This is the first of two articles I wrote on the subject of how artists can benefit from working with open edition prints. Reviewing the history the art print market reveals its growth has been fueled by both limited edition and open edition prints. In recent decades, the market divided into camps of limited edition and open edition print publishing models. Whole cottage industries of art print publishers matured around one model or the other. When managed properly, both models have proven to be successful. This is due to mainstream art buyers rarely favoring one model to the exclusion of the other. Such openness fueled opportunities for both limited and open edition print business models. Limited editions were borne from necessity. When the first prints were made, printing techniques forced small print runs. For instance, because etching plates degrade with each press pass, only a small number of high quality prints are possible. The practice of numbering prints was a natural evolution. Art sellers instinctively realized numbered limited editions created a powerful marketing tool, one still used in modern fine art print marketing. Although there are no limitations to producing very high quality digital prints, many artists and publishers, who have grown their business with limited edition prints, continue to use them to market gicleés. It is easy to understand why these marketers reject upsetting a profitable working model to move into open edition prints. Nevertheless, there are untapped prospects for them in the open edition market. Changes in the art print market over the past decade mirror other industries. Major factors include worsening economic conditions, changes in both wholesale distribution and consumer buying habits. Big box retailing, foreign imports, and the growth of e-commerce with its comparative shopping power and purchasing ease compounded the deviations. The speed of changes and widespread acceptance to them completes a picture of chaotic market disruption. Changes such as these have closed the doors on old business practices while creating new ones. The swift shuttering of 135-year old Decor magazine and its once dominant Decor Expo Atlanta tradeshow is a prime example of how quickly a business can become irrelevant and obsolete. On the upside, artists and publishers are finding new ways to use the significant advantages of print-on-demand (POD) technology, social media, online galleries, personal websites, blogs and more to create new marketing opportunities. Smart art marketers use POD technology to meet consumer demands as never before. Although adopting the idea of offering open editions that come in multiple sizes has not come easily to some limited edition art publishers and galleries, it’s time they take note. The future is calling. The success of Artaissance.com, a publishing company owned by picture framing manufacturing and distribution giant, Larson-Juhl, demonstrates how to take full advantage of POD technology. It encourages buyers to choose canvas or paper. Artaissance understands the importance to buyers of being able to order their art in the size they need to fit their unique spaces. This is a consumer benefit and sales and marketing opportunity rolled together. It’s no surprise the company uses www.ArtThatFits.com to promote its offerings. There is a rich history of artists whose works made the case for the open edition print market long before the advent of digital printing. Imagine how the estates of such print market giants as Maxfield Parrish and Ansel Adams would have suffered, as would have millions of their art buying fans, had either chosen to sell strictly limited editions of their images. The huge success of Art.com verifies art can effectively be sold via e-commerce. Since its business model is nearly all open editions, it also proves strong buyer demand for them. Interestingly, if you research top selling prints on Art.com, you find a mix of classic works by artists such as Van Gogh, Picasso and Monet along with contemporary pieces. This illustrates the interest in quality, both old and new and eclectic buyer tastes. These observations confirm that quality compelling work, whether old or new, and whether an open or a limited edition, can always find a market. And, they further demonstrate consumers are less concerned about open versus limited editions than wanting to own and live with an image special to them. Limited edition digital prints are not driven by consumer demand. While limiteds offer sales support in a closing room, it is the art itself, whether original, limited or open edition that brings buyers and sellers together. These are impressive results, especially given recalcitrant market conditions. Such success aside, the question remains whether the site’s accomplishments come at the expense of profits left on the table for those artists whose work would sell well for years to come in open editions. Given there is ample evidence of potential success with both limited and open edition models, artists frequently ask if they can use the same image both ways. There is no consensus about this question. It’s an ongoing debate leading to a personal decision only the artist can make. Why Should Visual Artists Be Saddled with a Business Model That Limits Their Income? I believe visual artists should not be forced to accept artificial caps on the potential income from their works. There is no model in any of the other arts where artists’ works are limited. You don’t find it in films, books, music or theatre. Nor is there any “sold out” backlash when a book, film, or record sells millions of copies. Visual artists should not have artificially imposed limitations on their income when more profitable options are available. Given digital printing dominates the print market, and has no constraints on endlessly producing pristine reproductions, the idea of using only limited edition digital prints seems arcane and not the best model for the print market in the 21st Century. I believe artists can succeed with the same image in both limited and open edition prints, if done with honesty, integrity and transparency. A limited edition of 100 prints in one size on one substrate, hand-embellished by the artist is suggested. This would serve gallery or collector demand for limited editions with full disclosure about open editions. Such an exclusive edition would create a collectible print edition and potential secondary market for the image. Open editions of the same image could then be offered on a variety of substrates and sizes. They would be of stated lesser quality than the limited edition. Because there are no industry standards on how to manage such practices, artists and publishers need to be transparent with their actions, including publicly posting notices of their publishing practices. Reputation Management is the Key to Success Building Repeat Buyers. How a publisher or artist manages providing full disclosure to all buyers of availability of both limited and open editions is crucial. Treating your buyers, prospective buyers, galleries and dealers with honesty, integrity, and consistency is how to succeed in the print market with open and limited editions. Savvy consumers have easily available powerful research resources, leaving no room for shabby marketing practices. By the same token, if artists conduct their business in a way that exudes high quality and high integrity, they can build a business model that will allow them to profitably sell their images in both open and limited edition markets without losing sleep or collectors. A second part to this series will appear next month. It will cover how open editions can affect an artist’s career and legacy. Readers will learn about the hidden costs in limited editions, and get details on artists who have had success being in both limited and open edition print markets.